Check out the excellent Halloween drink recipes on this site. As we all know, "Halloween started with the Ancient Celts. All Hallows Eve (which became the word Halloween) was the last day of their year. They believed November 1st (All Saints Day) was the start of the New Year and because it was Winter, it was the darkest time of the year. On this one night, October 31st, they believed spirits, ghosts, goblins and fairies came down from the hills into the towns. Some people believed if you left "treats" on the front porch for the spirits and ghosts, this would make them happy and they would not hurt you." 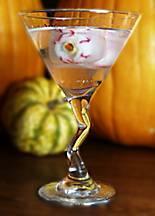 Now, check out these recipes for some Halloween "Spirits" and enjoy yourself this Halloween.